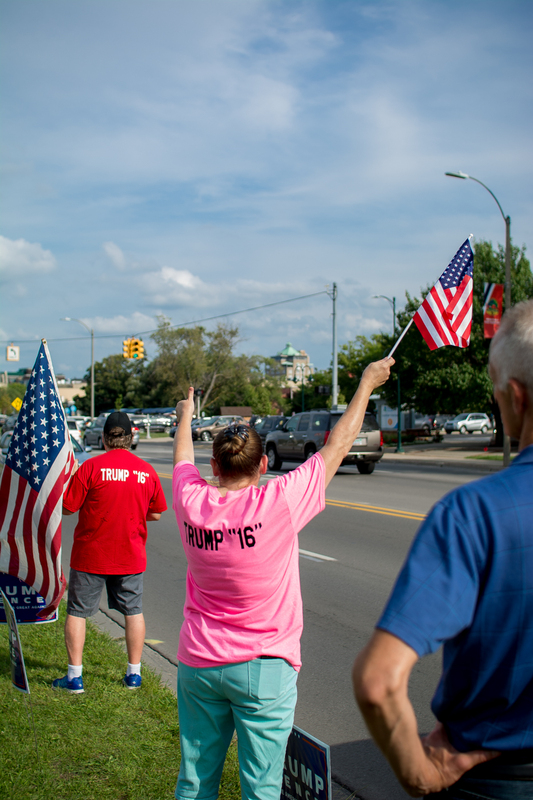 In Traverse City the 100 or so patriots who stood out to express their support for the Trump team found a quite different reality than what might be seen with social media attachments to stories which cover the actual events. If the race was to be decided by Thumbs and Fingers, then the thumbs win – hands down, and those same thumbs up. 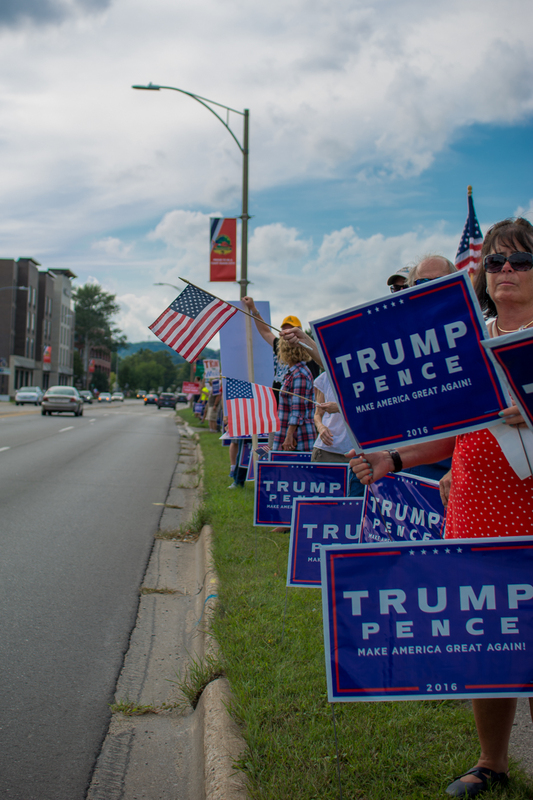 From police passing by to truckers, to kids randomly passing and joining the rally, it was clear that support for Trump outweighs those who dislike, or expressed a dislike. Over 500 Horn honks and waves made it easy to smile through the entire affair. There was even a “Democrats for Trump” sign carrier. Some passers-by were obviously happy to see the ‘insta-rally’ and their expressions were gratifying. For those who might think that these events have no effect, this is especially important. We’ve absolutely seen it before. The Tea Party movement began in this way. People who had been successfully driven into their own political isolation by misinformation and calculated isolation methods have again found allies willing to stand out in front with them. One guy in particular showed up halfway through in his business suit and tie, snatched up a sign and got right into the action! Though this is not a broad movement like the Tea Parties, it has much of the same emotion attached to it. The people seem to be coalescing behind a single figure, and not an idea, yet the figure represents the continued hope of busting apart the stranglehold of the ‘civil’ yet corrupted political process we have been seeing in the last decade. So, is it a movement? Trump is not an ideal candidate for some who might share that same hope with so many on both sides, but he might be the only one who can act as the change agent to make it work. So, yes, we should hope so. Since when has politics been so much fun? 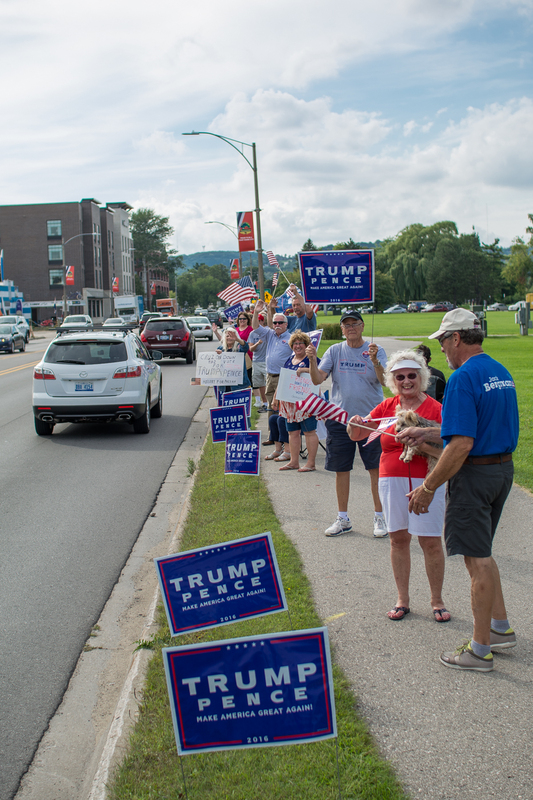 OMG, all the new faces, folks begging for Trump signs for their front lawns. I assumed the job of stickering the participants--so they'd be properly attired. Met a lot of folks who were looking for someplace to belong and to learn more, other than from the media--gosh darn, I know of some places. 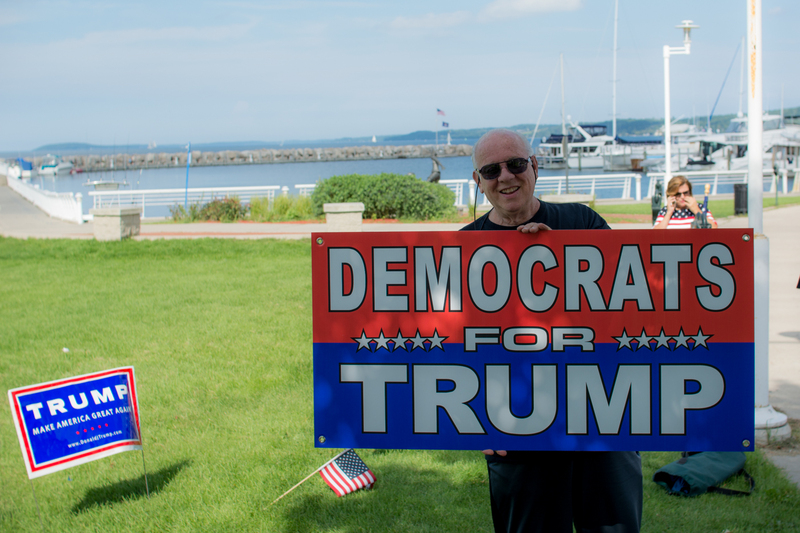 There were three outta state guys who just couldn't pass up the "Democrats for Trump" sign. They got stickered, got their keep-sake photos and the best part, they were from Chicago. I did tell them I'm sorry. All the kids on skateboards, genuinely wanting to participate and take a sign home for their lawns. More than the honks were the folks driving by giving a silent thumbs up. What was also humorous, was as soon as I parked my car, there was a meter reader anxiously ready to give me a ticket. Wait, isn't there a grace period between parking and putting money in the meter? Yes, there is, and a parking ticket was staved off. 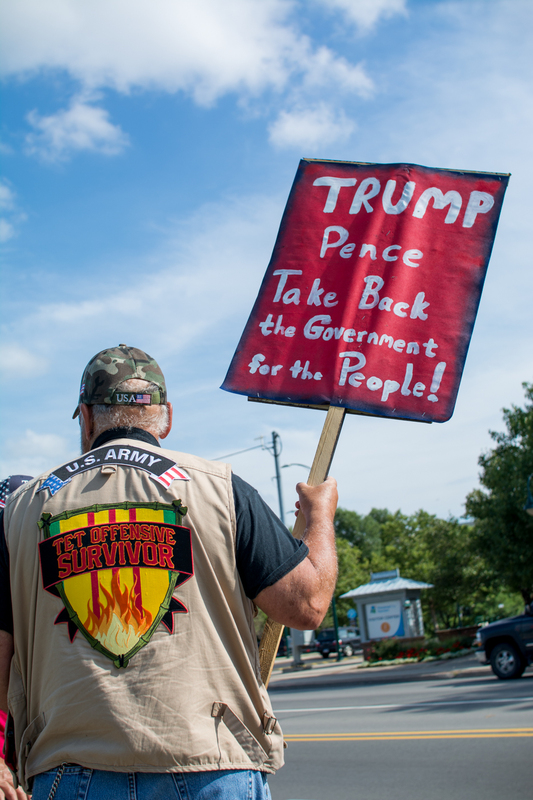 There was even a park ranger who showed up and said our signs couldn't be there--he left soon after afraid, I'm guessing, of getting stickered or maybe it was the freedom of speech he was about to get. All-in-all, very refreshing politics. Can't wait for the next one. When our grandchildren come to the realization that 'flash mobs' were the extent of both meaningful gatherings let alone serious debate surrounding the most critical election in both their lives and ours? I'm guessing they'll hope that God sorts us all out. To equate these singular events featuring no meaningful speakers or audience participation with the state's recently (failed) 7 year long Tea Party 'movement'-that-never-was? Perhaps so, yet won't both rate no more than a 'footnote' in our children's history books for the very same reasoning? You are the perfect example of why people throw their hands up and say "whatever." We are fighting a war for the hearts and minds of those who might be on the edge, and for all our efforts we have the armchair soldiers who have no response but "we're doomed I tell ya!" You might think there is no meaningful result, yet while we were in TC alone, it drew people in, and it engaged others who went by. The point was made that while typical news sources are once again trying to downplay this paradigm change, it is nonetheless happening. However without the occasional event (even without 'meaningful' speakers) it might just wither. If you don't wish to attend these, then don't. But belittling such efforts as a waste of time is counter productive to the end game. I KNOW they work, having been through it. If all you want to do is kvetch, find a new place where you can apply your positive attitude for team Hillary the criminal. Please. I wouldn't sweat J.D. too much, J-Man. I've managed to figure out that he's something of a "concern troll" and you know what they say about trolls . . .
(kevinrexheine): "..I've managed to figure out that he's something of a "concern troll" .."
The 'concern' for Michigan conservatives in but a few weeks will become how history judges the efforts both led and executed here over the past 7 or so years. Excluding those who demanded realistic vs 'obligational' math combined with the self-sacrifice desperately needed by all Michiganders (not just the younger ones) destroyed any chances of multiple party unity whatsoever. You many not want to frame the final days of conservatism or its failed leadership here in Michigan from that perspective, Kevin...yet I can guarantee that your grandchildren will. Convincing our kids to show up on a safe street corner without even a coherent spoken message to share, let alone an opportunity to speak out themselves, is not akin to insisting that they show up on 3 cold lame duck December days with 10,000 (plus) angry opposition protestors more than willing to take their heads off with the blessing of pretty much everyone around them. If you want me to go elsewhere for speaking the truth...pull my posting privileges. Pretty simple. I am simply here to tell you that 1) NOTHING is that easy 2) our children are smarter than that in terms of any effort required and 3) that history has already proven so but 4 years ago right here in Michigan. The videos of those tents coming down back in '12 will be spliced in to these 'flash mob' non-events mere weeks before the most critical election in their lifetimes to vividly illustrate just how little Michigan conservatives learned or obviously cared about their grandchildren's future. "You hold up a sign for a few minutes...I'll honk at you if I just happen to be driving by...and we'll both feel good about ourselves ala every brave soul who ever actually fought or died for the cause of freedom (here's your sign).."
Our founding fathers simply worked too hard and sacrificed far too much when the country's future was (similarly) at stake. 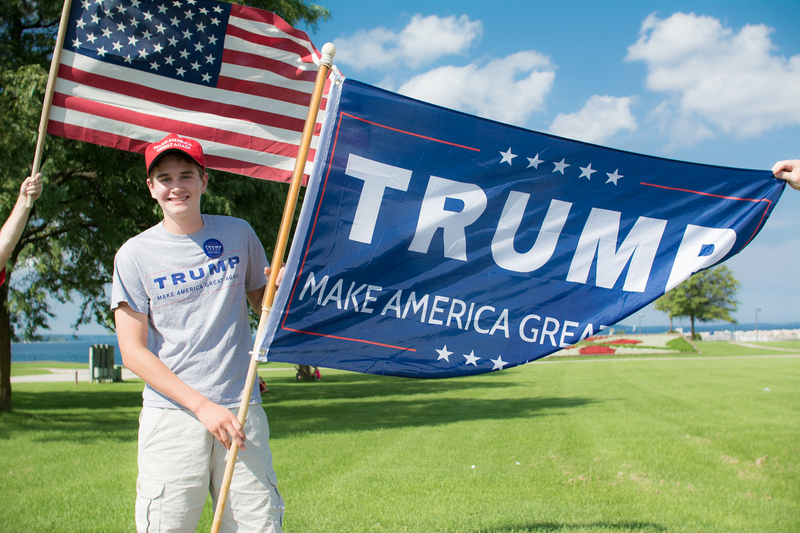 JD, the spirit of the tea party is alive and well--but known by a new movement--TRUMP. In fact, when Trump gets elected I understand all the riff-raff in this country are leaving--like Streisand, and a few others. I'm going to hold these creepy entertainers to their word. BTW, it costs big bucks to renounce one's citizenship and if they all leave, it may well balance our budget. "..the spirit of the tea party is alive and well--but known by a new movement--TRUMP..."
...and find one...maybe two..of both combined? How does that compare 'alive and well(wise) with even so much as a flag not long ago (the now near extinct Gadsdens) or for that matter your odds of being approached by someone with a dozen copies of the constitution in their hand? Yet (today) a 'flash mob' is (somehow) something to write home about or the only sustainable (non)educational movement driving statewide conservative politics in...September?